January 27, 2016 By This post may contain affiliate links. Grab some refrigerated cookie dough and a can of cherry pie filling and make these 2 Ingredient Heart Shaped Cherry Pie Bars. 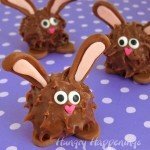 They are delightfully easy to make for Valentine’s Day. Don’t you just love being able to whip up simple yet festive desserts for a holiday? 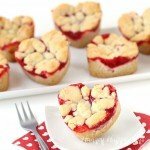 These heart shaped cherry pie bars could not be easier to make. As with most holidays, I am super busy, always trying to get as many new recipes created as possible so I can share them with you. 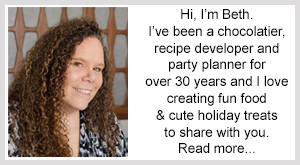 I know your version of busy is different than mine, but I’m guessing you appreciate having quick and easy recipes to make for holidays and special occasions just as much as I do. The idea to make these easy cherry pie bars came from a recipe created for Tablespoon.com. When I saw how sugar cookie dough was combined with cherry pie filling to make a pan full of bars in a few minutes, I just had to try them. I loved that bits of the red cherry filling peaked out amidst the cookie dough and immediately imagined what they would look like shaped like hearts for Valentine’s Day. 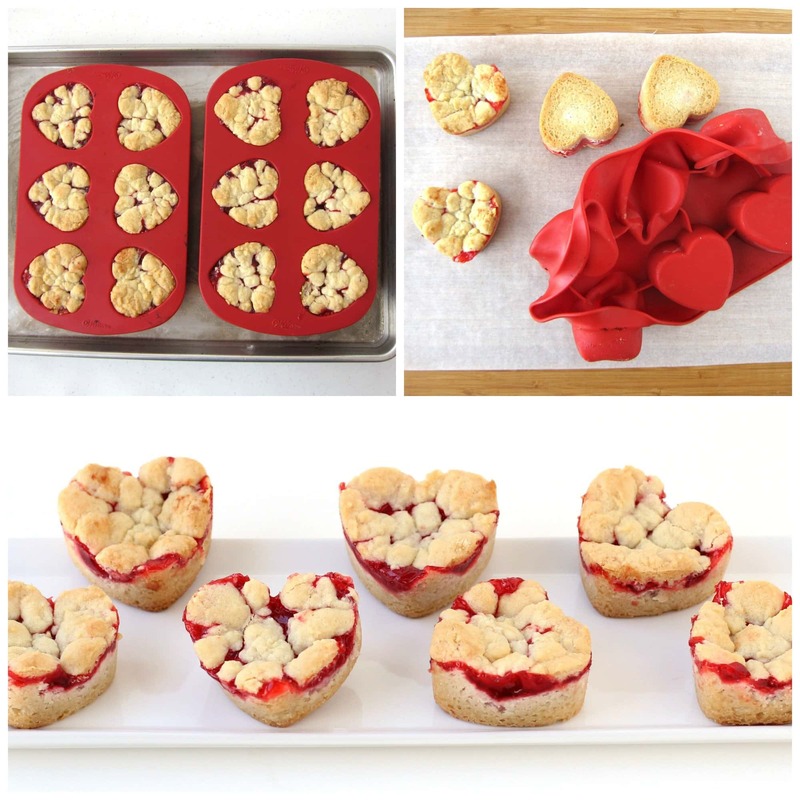 To turn the cherry pie bars into hearts, I used one of my absolute favorite kitchen tools, a silicone heart mold. 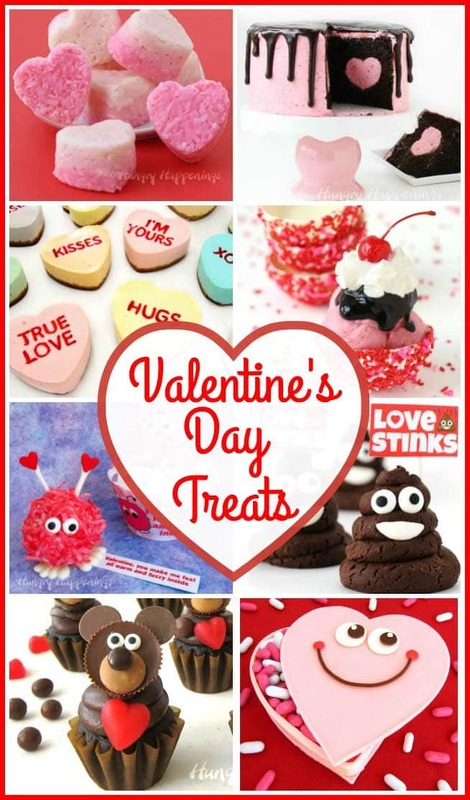 I’ve used these same molds to create a new dessert every single Valentine’s Day since I began blogging. 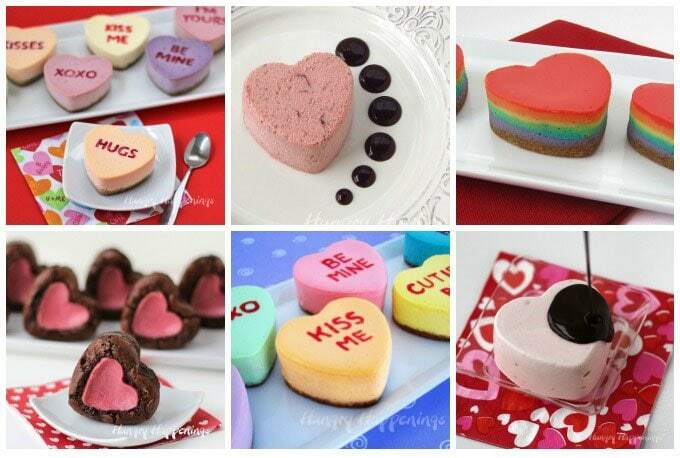 Over the years, I’ve made Naturally Colored Conversation Heart Cheesecakes, Cranberry Orange Semifreddo Hearts, Rainbow Cheesecake Hearts, Raspberry Cheesecake Stuffed Brownie Hearts, Traditional Conversation Heart Cheesecakes, and even Dairy Free Chocolate Covered Strawberry Mousse Hearts all using the same molds. If you’ve not ever used a silicone mold, I highly recommend you give them a try. 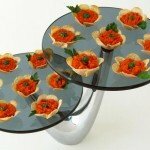 They have a naturally non-stick surface and can be used to create baked goods, frozen treats, or chocolate. To make these Heart Shaped Cherry Pie Bars all you need to do is break up refrigerated sugar cookie dough and place a heaping tablespoonful into a heart shaped cavity, press it into an even layer with a small lip around the edge. Spoon on some cherry pie filling and top with small pieces of cookie dough. If you want to add another flavor dimension, sprinkle some cinnamon sugar over the cookie dough before adding the pie filling. Pop them in the oven and bake until golden brown and bubbly. In order for your hearts to keep their shape, they need to be cooled completely before you can remove them from the molds. 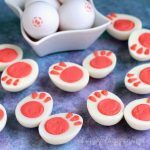 I found it quickest to just pop them in the freezer until they firm up enough to easily push them out of the mold. You can serve these sweet Valentine’s Day treats at room temperature or pop them in a 250 degree oven for 5-8 minutes just to warm them through. 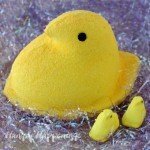 You can even package them in individual cellophane bags, tie them with a ribbon, and give away as gifts or use as party favors. 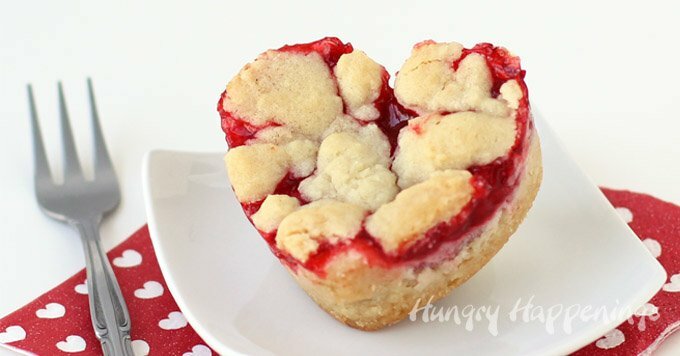 Pretty cherry pies shaped like hearts made with sugar cookie dough. 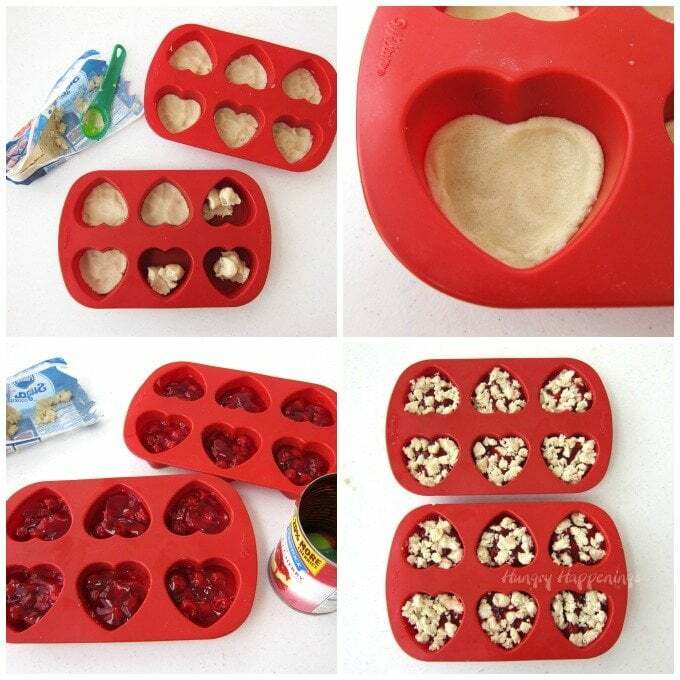 Scoop a heaping tablespoonful of sugar cookie dough into 12 heart shaped cavities in 2 silicone molds. Flatten dough into an even layer then press down in the center creating a lip around the edge of the mold. Equally divide the cherry pie filling covering the cookie dough hearts. Break the remaining cookie dough into small chunks and scatter them over the pie filling in each of the hearts. Bake for 25-30 minutes until the cookie is golden brown. Set molds on a cooling rack and cool for 30 minutes. Place in the freezer for at least one hour until firm. Un-mold by pressing on the backside of each heart cavity allowing the bars to fall out into your hand. Turn right side up and allow to warm up to room temperature. Serve at room temperature or heat until warmed through. What a great recipe! So easy! And the heart shapes are so adorable! What temperature do you bake these at the first time around? 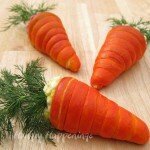 I saw that you can warm them at 250 degrees after they are finished, but I did not see the temperature to bake them at for 25-30 minutes. Thanks! Oh, I’m so sorry, I left that out when I wrote the recipe. Bake them at 350. Enjoy! 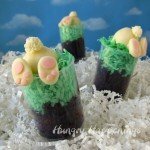 Have you ever tried these with Snickerdoodle dough and apple pie mix? No, but that sounds amazing!! !